Bergama is a small town in Turkey, 80 kilometres north of Izmir. Its archaeological fame derives above all from an altar, the remains of which are displayed in a Berlin museum that even bears the town's ancient Greek name: Pergamon. Not quite so famous as the altar is the enormous temple dedicated to multiple deities and situated in the heart of Bergama; together with a forecourt it covers an area almost as large as that of Trajan's Forum in Rome. The towering structure threw much else into the shade and inside it were sculptures on the same colossal scale. Figures eight metres high and wearing bulky headdresses held up the stoa roofs, creating the right atmosphere for worship of the gods and practice of the probably imperial cult – for the temple was Roman, dates from the 2nd century AD and the involvement of the Emperor Hadrian in its erection is very likely. The support figures were inspired by images of Egyptian deities and it is suspect that they found their way to Pergamon through the well-known trip of the emperor to the Nile and his following travel through Asia Minor. The building project radically changed the urban landscape; even the river Selinus was channelled through two tunnels, and today the ancient ruin is still a dominant feature of modern Bergama, which accordingly can boast one of the most significant Roman monuments in all Asia Minor. The main temple building is known as the "Red Hall" after the red bricks from which it is made. Unlike the ruins of the Hellenistic citadel, the Red Hall was absorbed into the modern town. It therefore never became covered by earth, but was reused for various purposes over a period of more than 1500 years. This repurposing necessarily left its mark. The southernmost of the two round towers, for instance, once accommodated an olive processing factory, among other things, and was particularly at risk. Rainwater entered the building through the original Roman dome, while archaeological finds weighing several tons were stored on a fragile, vault-borne floor which had already collapsed at several points. In 2006, the Istanbul Department of the German Archaeological Institute (DAI) launched a long-term project – directed by Felix Pirson and Martin Bachmann and supported by the Studiosus Foundation e.V. 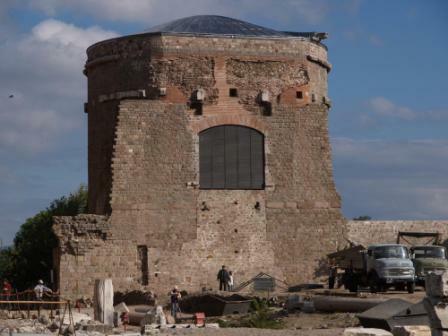 – to restore the tower and to consolidate and re-cover the original Roman dome construction. 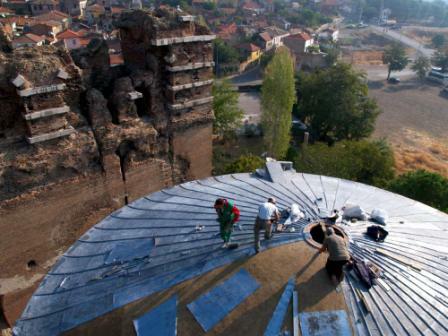 In 2008, with funding from the Foreign Office's cultural heritage preservation programme, a durable lead covering was laid on the dome to protect the ancient fabric for the coming decades. Once this part of the project was finished, visitors could be admitted for the first time to the impressive interior of the rotunda. The opening ceremony took place in September 2009. In the same year another project began in one of the side courtyards of the Red Hall – likewise with the assistance of the Studiosus Foundation. Here, one of the support figures which formerly lined the courtyard in place of columns and fragments of which are now exhibited inside the rotunda was reconstructed in its original height and using some of the original pieces. 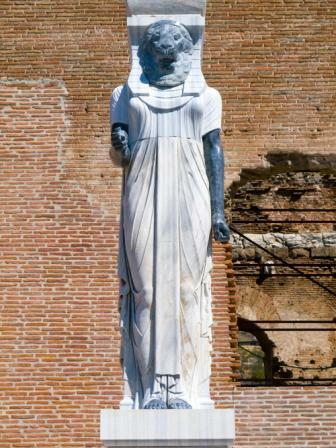 The Egyptian deity Sekhmet was re-erected in Bergama on 26 September 2013. The combination of research and preservation as practised by the DAI produces lasting and sustainable results and has created milestones in the preservation and presentation of archaeological monuments in Turkey. Modern urban and social contexts are playing an increasingly important role in this. The Red Hall was chosen as a core project because it fulfils a key function in the new tourism development plan for Pergamon. The support figures were inspired by images of Egyptian deities. In future, the old town of Bergama with its many monuments of Ottoman and multiethnically influenced architecture will be integrated to a larger extent in the sightseeing programme. Visitors will thus be able to experience 4000 years of settlement and urban history in the eastern Aegean in and around a modern Turkish town. The new presentation plan for the town of Bergama spans the epochs and encompasses the surrounding area. 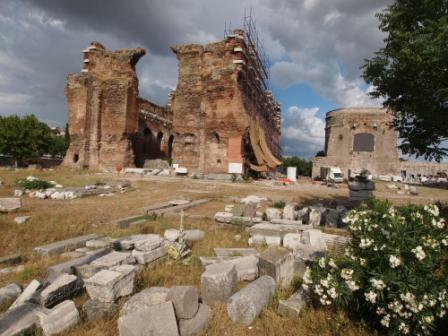 That was central to Bergama's addition to the list of UNESCO World Heritage Sites in 2014. The past, present and future of the town are consequently woven together in this DAI project in a way that benefits not only archaeological research but also the town itself. Project: Prof. Dr. Felix Pirson, director of the Istanbul Department of the DAI and director of the Pergamon Excavation.